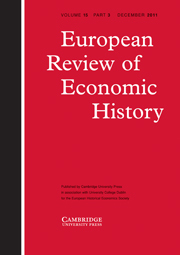 European Review of Economic History has established itself as a major outlet for high-quality research in economic history, which is accessible to readers from a variety of different backgrounds. The Review publishes articles on a wide range of topics in European, comparative and world economic history. Contributions shed new light on existing debates, raise new or previously neglected topics and provide fresh perspectives from comparative research. The Review includes full-length articles, shorter articles, notes and comments, debates, survey articles, and review articles. It also publishes notes and announcements from the European Historical Economics Society.